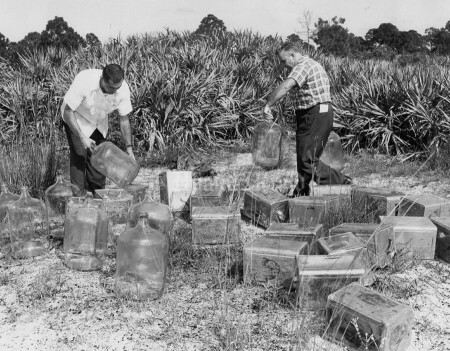 Florida has a long history of moonshiners and rumrunners. 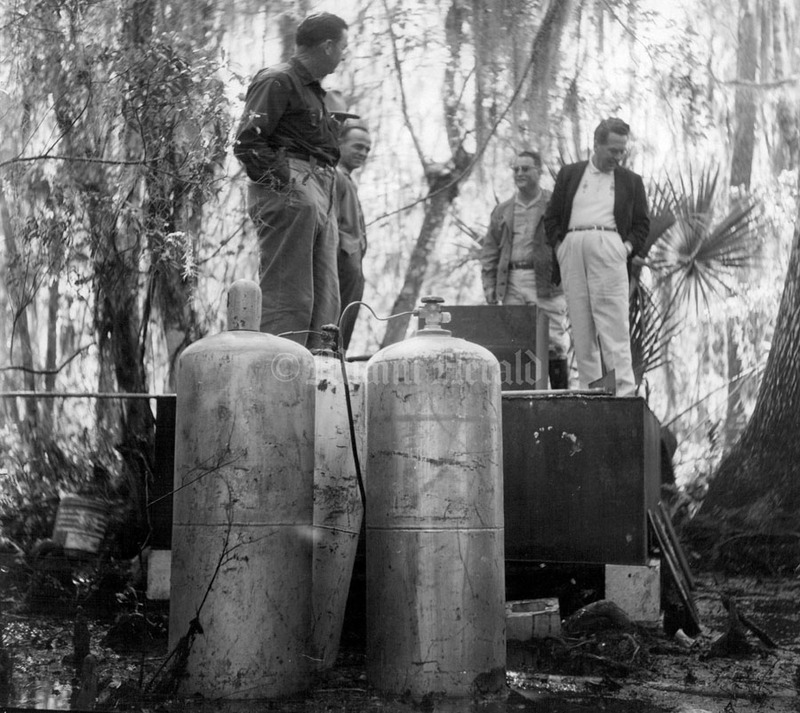 But long after Prohibition ended in 1933, moonshiners continued to make illegal liquor in South Florida cities and the Everglades. Into the 1950s and ‘60s, police and revenue authorities battled the moonshiners in Miami, Fort Lauderdale and other parts of the South, seizing untaxed home brew from car trunks and houses, and raiding stills hidden in the palmetto scrub. 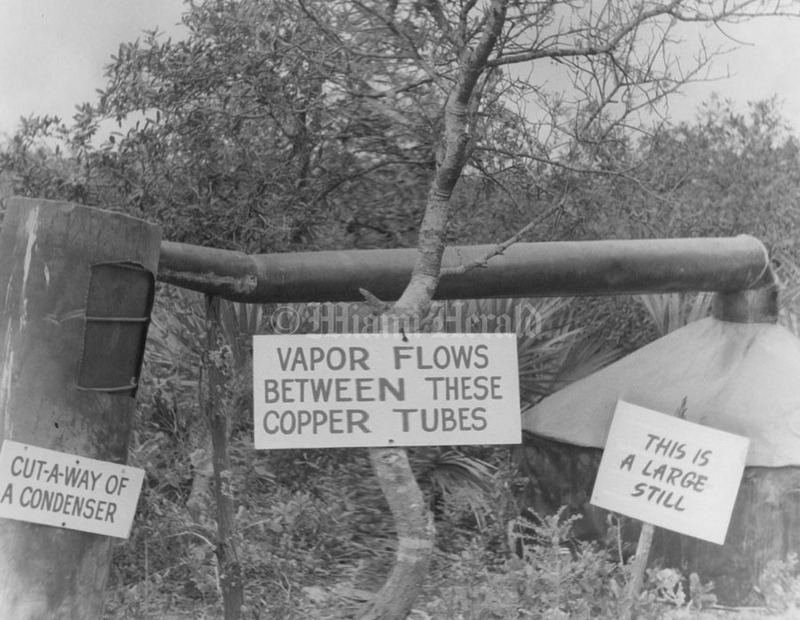 10/8/1957, Helen A. Rogers/Miami Herald Staff: "Vapor flows between these copper tubes." 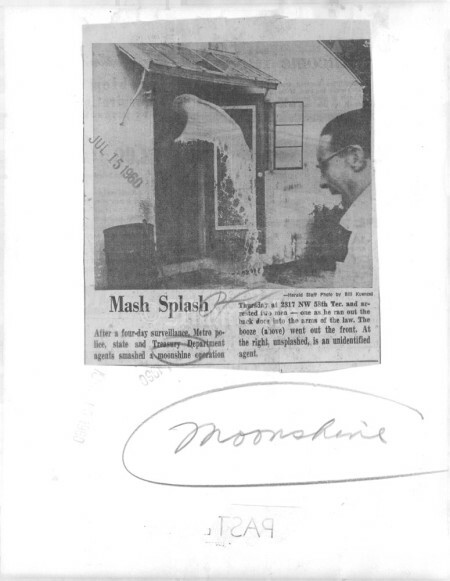 Moonshine. 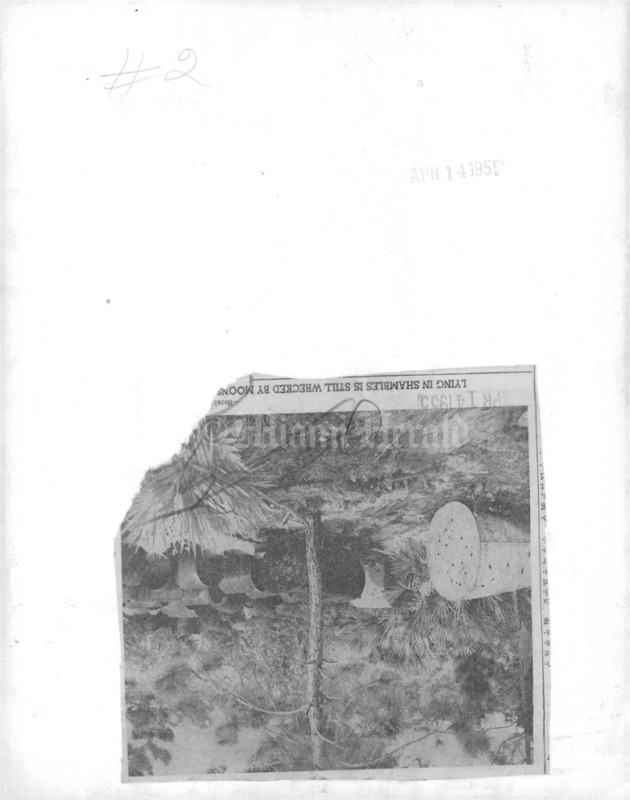 7/23/1955, Charles Ralston/Miami Herald Staff: Where the moon shines bright. Officers Pickard, right and Tindall check car. 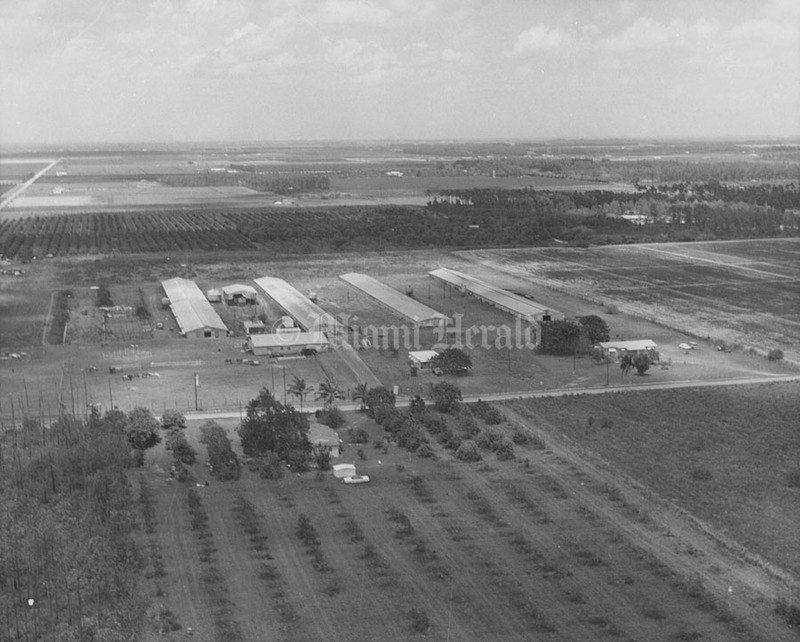 7/23/1955, Charles Ralston/Miami Herald Staff: (back of photo) Where the moon shines bright. 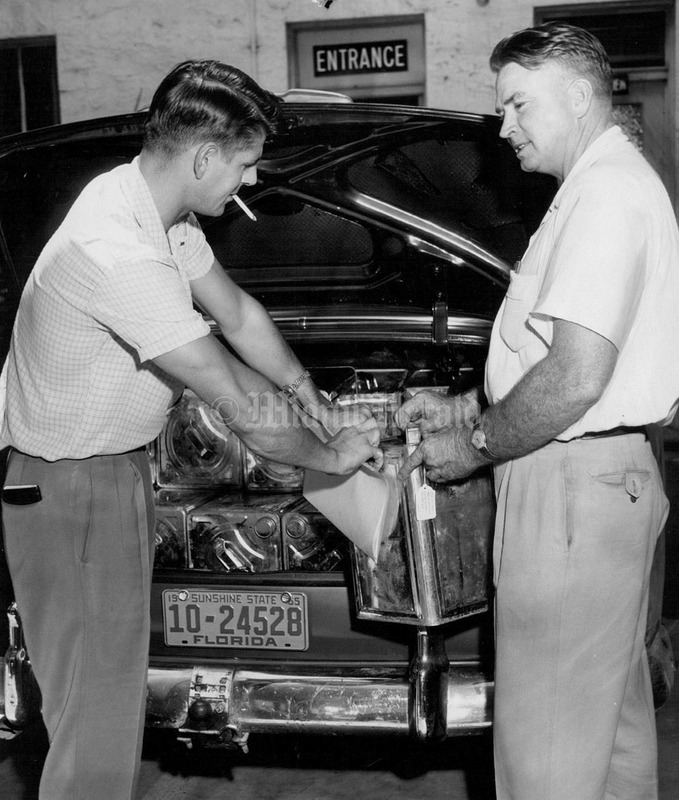 Officers Pickard, right and Tindall check car. 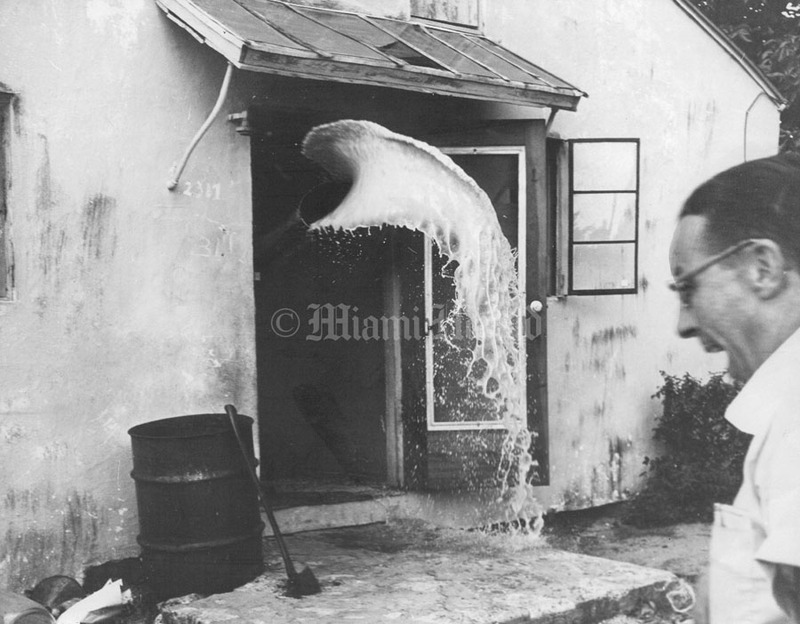 7/15/1960, Bill Kuenzel/Miami Herald Staff: Mash Splash. 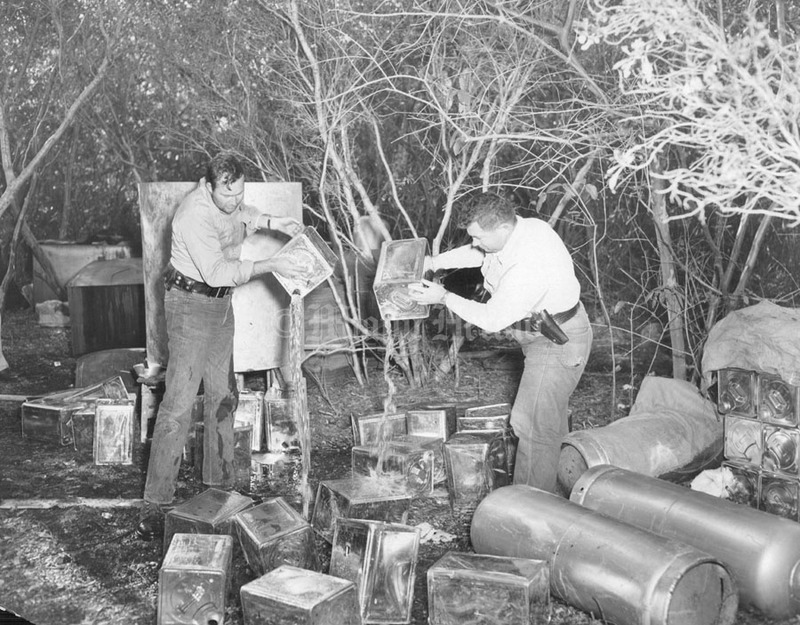 After a four - day surveillance, Metro Police, state and Treasury department agents smashed a moon shine operation Thursday as 2317 NW 58th Ter. 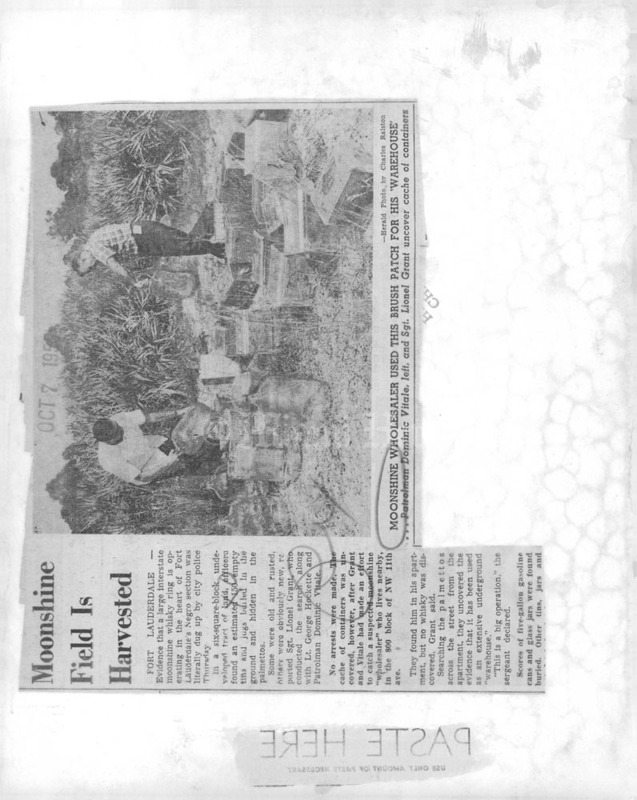 and arrested two men- one as he ran out the back dock into the arms of the law. 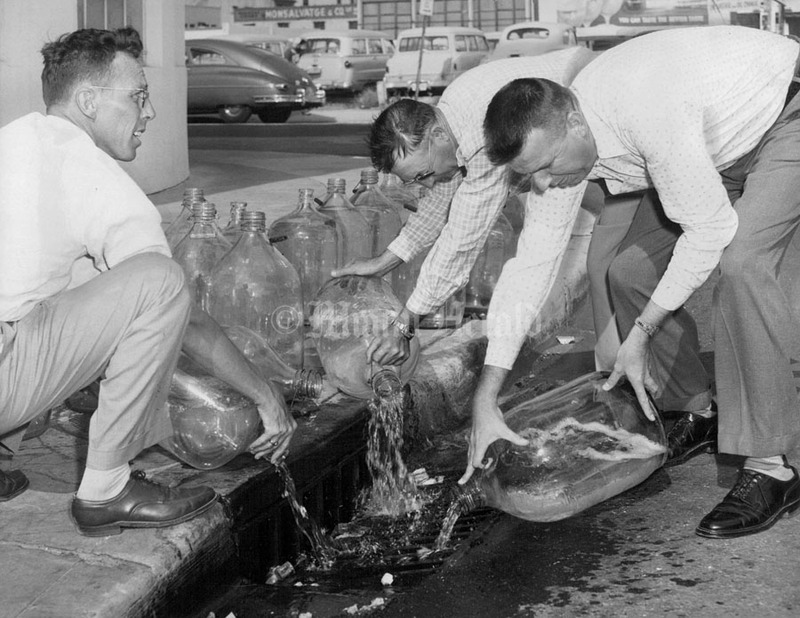 The booze (above) went out the front. 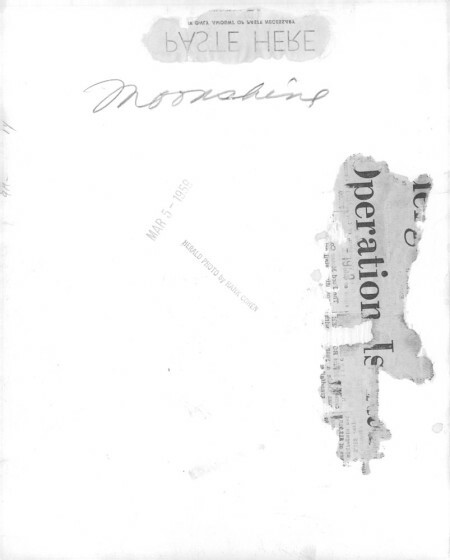 At right unsplashed, is an unidentified agent. 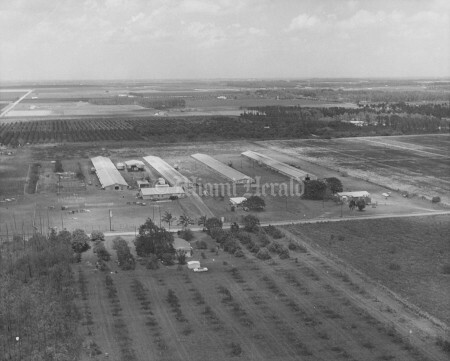 10/7/1950, Charles Ralston/Miami Herald Staff: Ft. Lauderdale Moonshine Wholesaler used this brush patch for his 'Warehouse'. 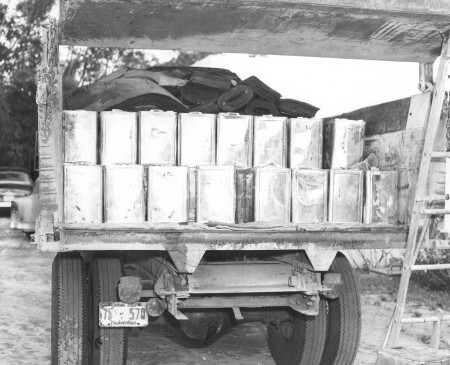 Patrolman Dominic Vitale, left, and Sgt.Lionel Grant uncover cache of containers. 7/15/1960, Bill Kuenzel/Miami Herald Staff: (back of photo) Mash Splash. After a four - day surveillance, Metro Police, state and Treasury department agents smashed a moon shine operation Thursday as 2317 NW 58th Ter. and arrested two men- one as he ran out the back dock into the arms of the law. 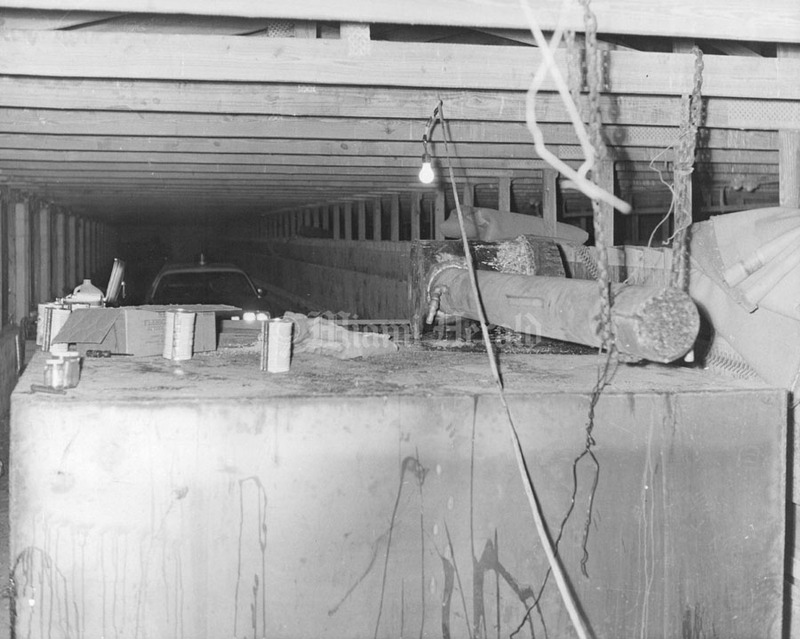 The booze (above) went the front. 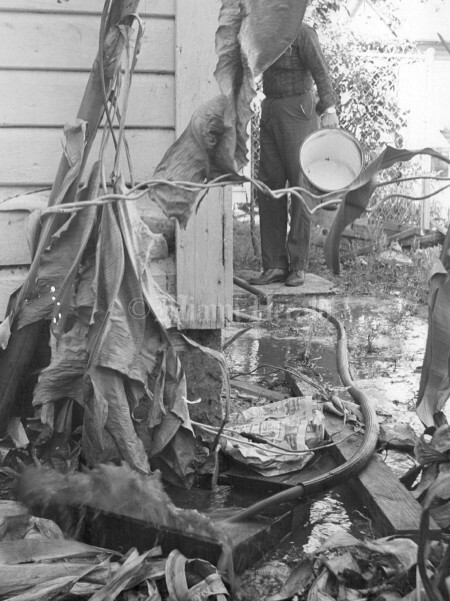 At right unsplashed, is an unidentified agent. 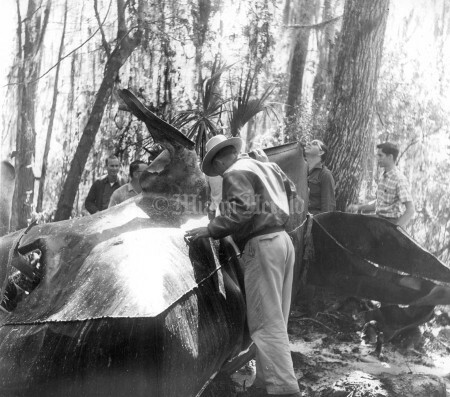 3/27/1955, Miami herald Staff: Giant moonshine still is surrounded by liquor agents after a raid 45 miles southeast of Sebring. 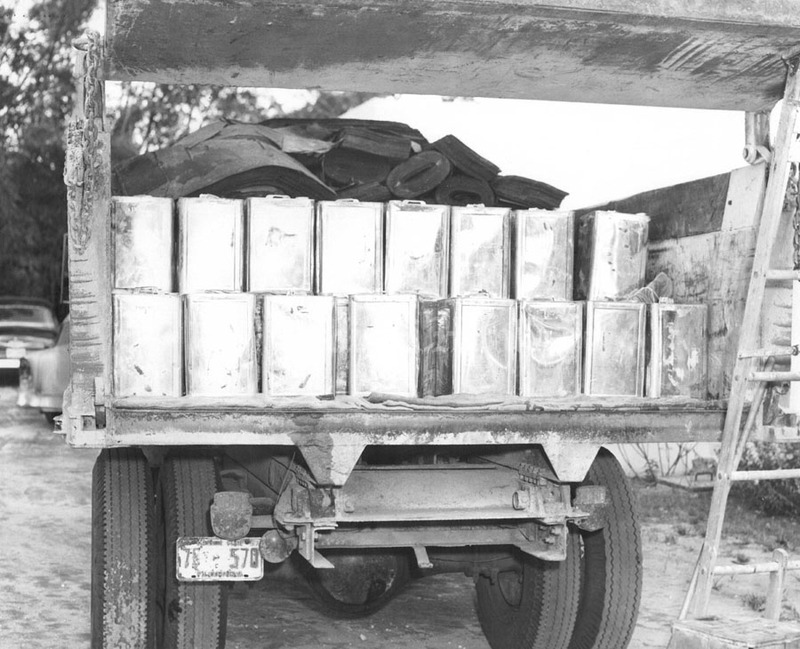 Robert Lee Hethcoat,30, of Lake Placid, was arrested at the scene, Seized were 405 gallons of moonshine and a 1952 truck. Officers also found 6,525 gallons of mash ready for distilling. Agents, from left, are L.E Wolff, Edward Malys and Walter K.Kelley. 1/1/1961, Miami Herald Staff: Moonshine stash. 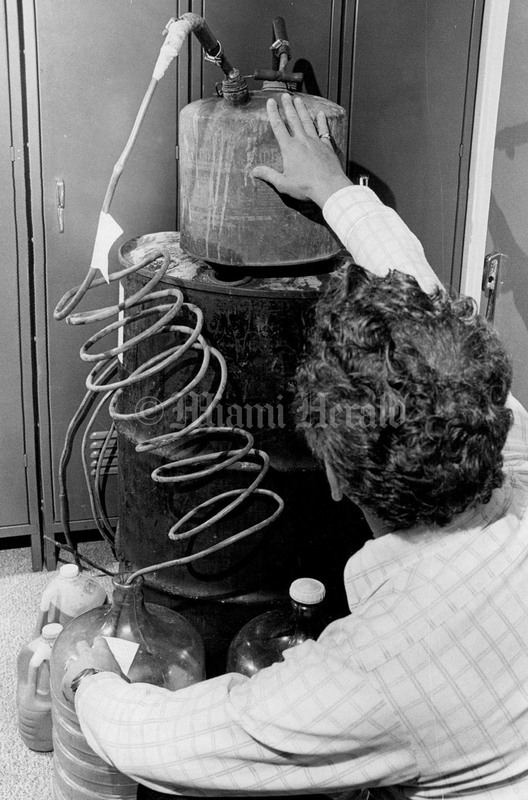 2/20/1964, Mark Peterschmidt/Miami Herald Staff: Sour mash or whatever booze is made of is being pumped out of house at 555 NW 11 Ter. 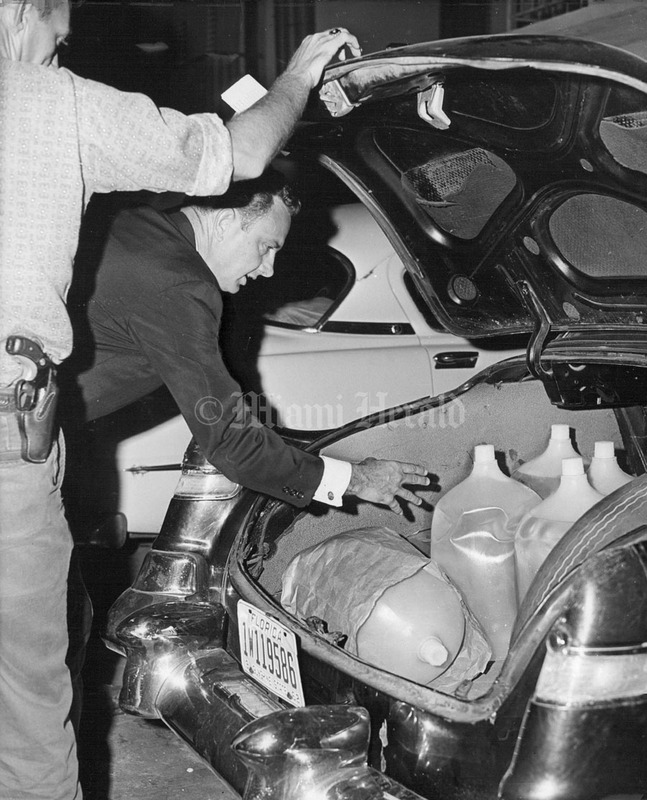 one of investigators with pail that had been checked for fingerprints. 2/23/1964, Miami Herald Staff: Moonshine still. 11/28/1956, Miami Herald Staff: Sheriff Roy baker dumps Moonshine from car abandoned in orange grove. 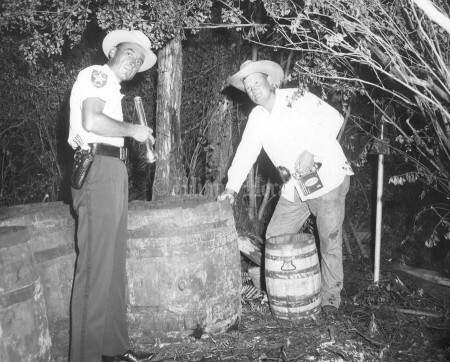 2/23/1956, Bill Sanders/Miami Herald Staff: Sixteen barrels of sour mash, in varying degree of fermentation, and a partly filled jug of moon shine were destroyed by agents of the state Beverage department who raided a still in a heavily wooded south Dade section Wednesday. The agents, under Fred Park, chief enforcement officer, teamed up with constable George Wright. 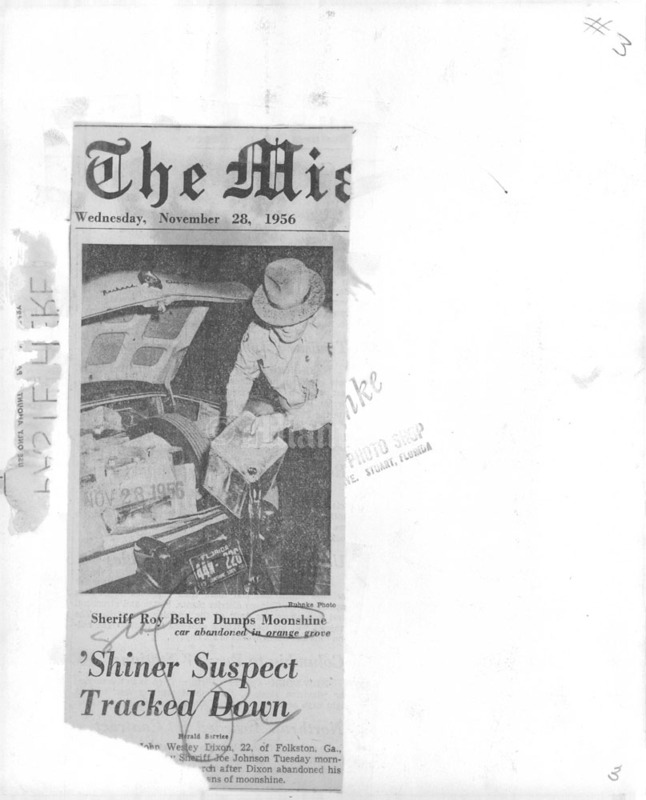 When they arrived, the fire under the boiler was still burning, but the moon shiners had made their getaway. Agent W.A. 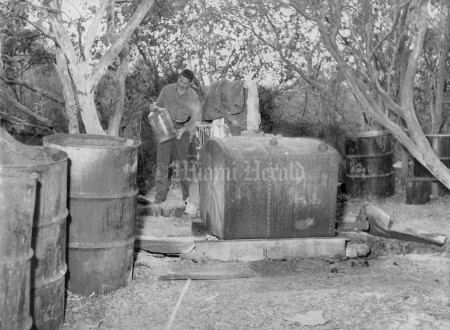 (bud) McCarron displays a partly filled jug of the whisky found at the still, west of Perrine. 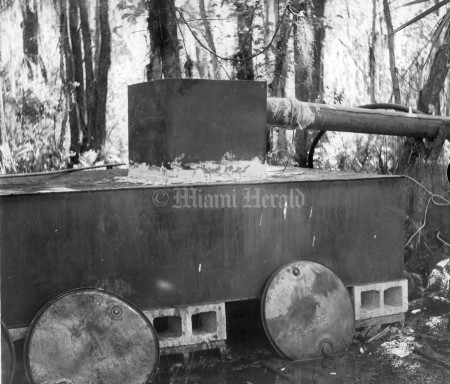 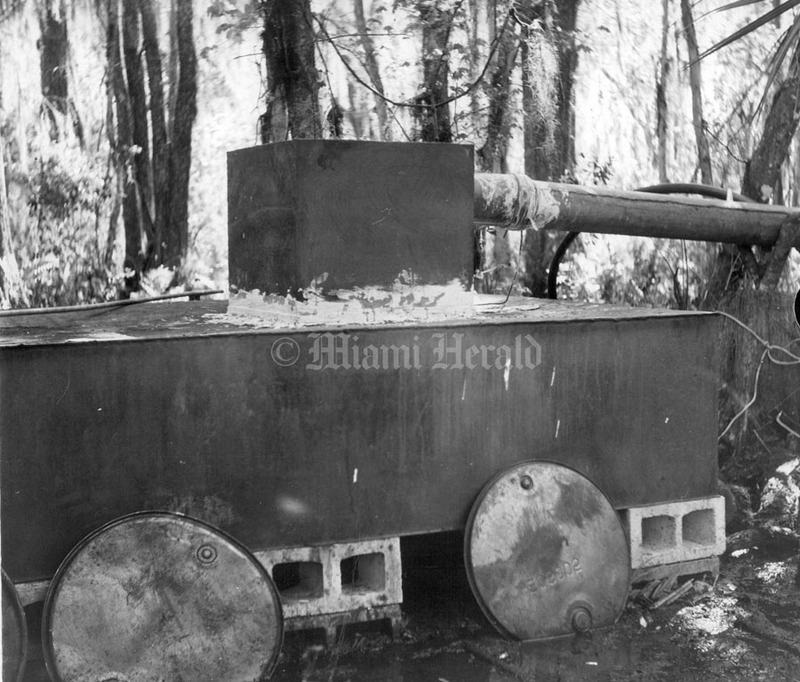 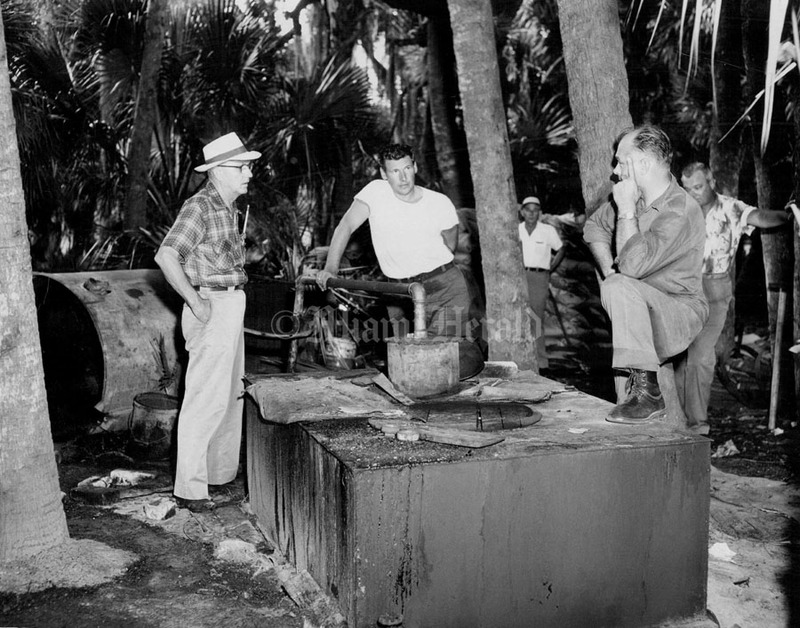 10/8/1957, Helen A. Rogers/Miami Herald Staff: "The man was caught operating this still. 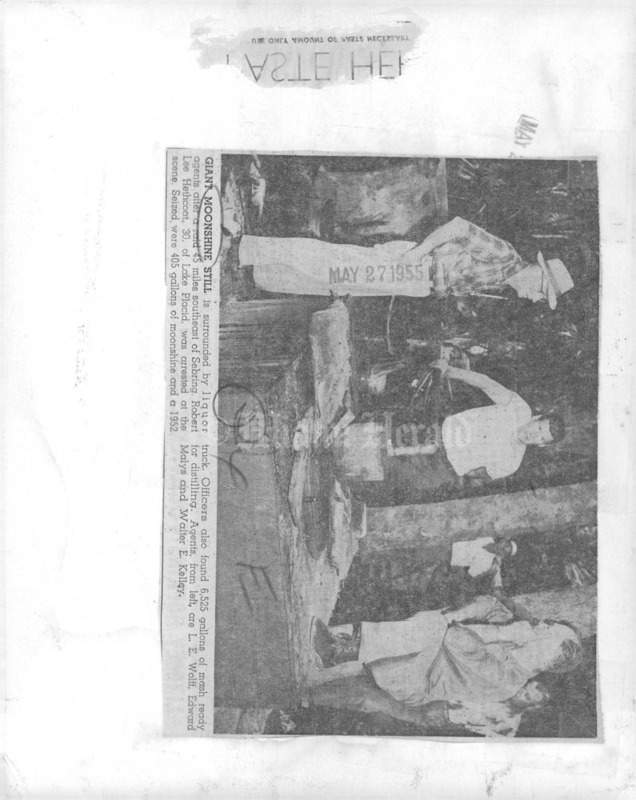 Today he is in Raiford Fla State Prision." 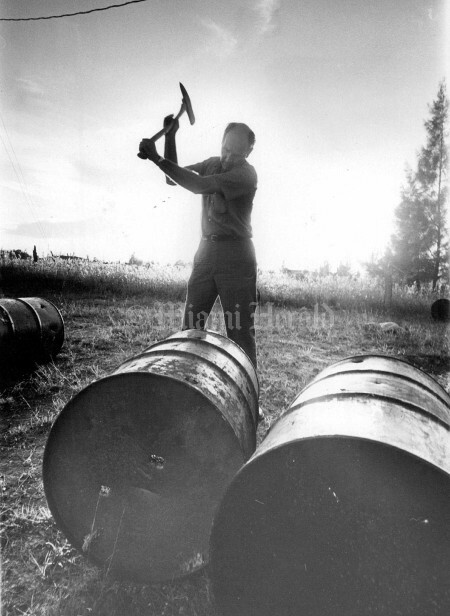 "Some stills have a capacity of over a thousand barrels. This is a small, two barrel still fired bt charcoal and capable of producingenough moonshine to cost you, the taxpayer, aver $5000 monthly." 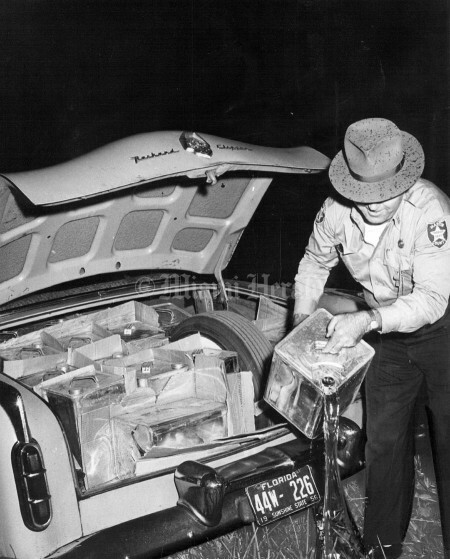 6/18/1963, Bill Sanders/Miami Herald Staff: Miami policeman Lee Hatton Jr.inside the truck which housed the still. 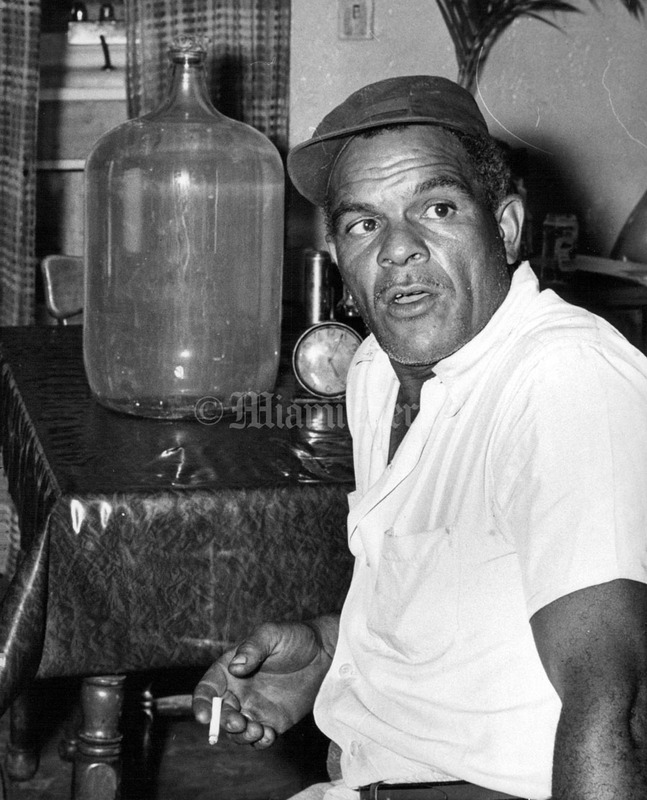 7/6/1979, Blaine Harden/Miami Herald: Former bootlegger Posie Hale, left, broke down and cried when arrested -- all eight times. James Atkins says he'd still be making moon shine " If could lift the sugar bags." 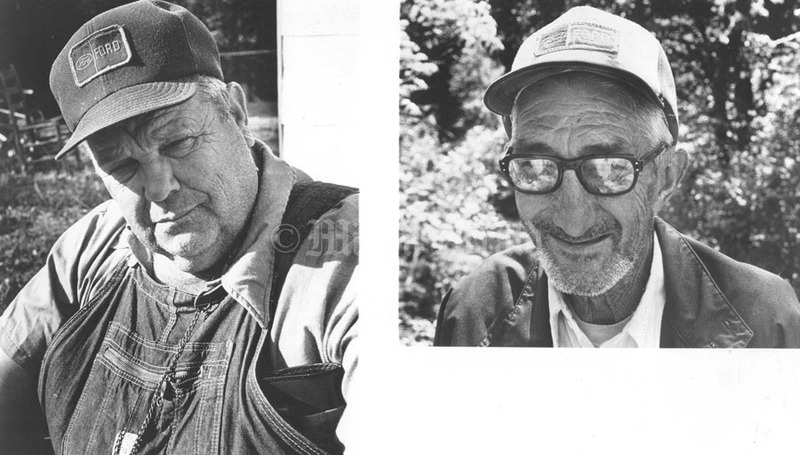 They live in Franklin County, Va., where stills still are busy. 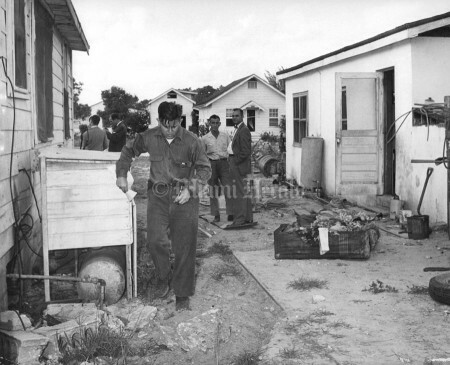 5/10/1978, Battle Vaughan/Miami Herald Staff: State beverage agent (couldn't show face) inspecting still taken in Perrine raid Pedro Antonio Vasquez of 10255 SW 178 St taken into custody pu metro public safety dept. 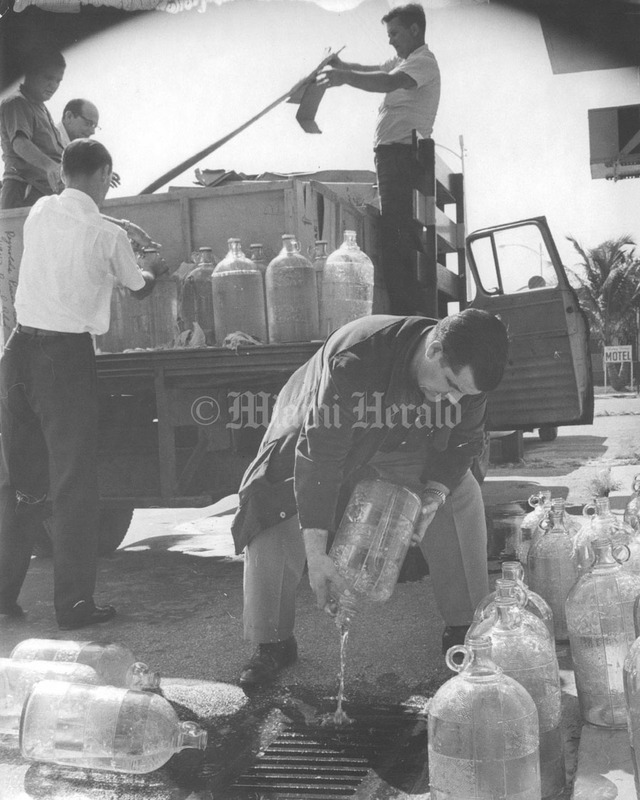 4/12/1956, Steve Wever/Miami Herald Staff: One way to get rid of Moon shine is to dump it in a city sewer, as federal alcohol tax agents are doing after a raid Wednesday at 10500 Coral Way led to the arrest of Ira Black, 29. 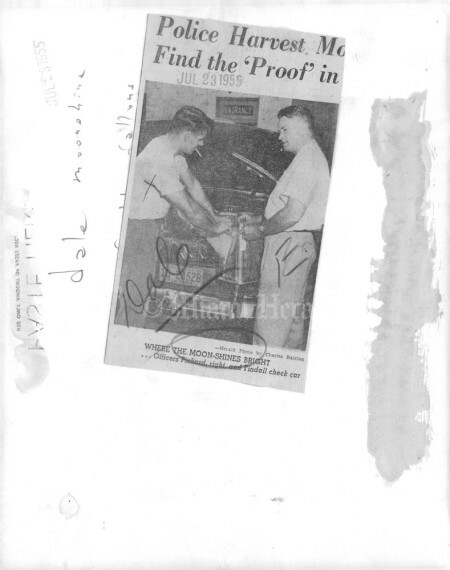 He posted $500 bond. 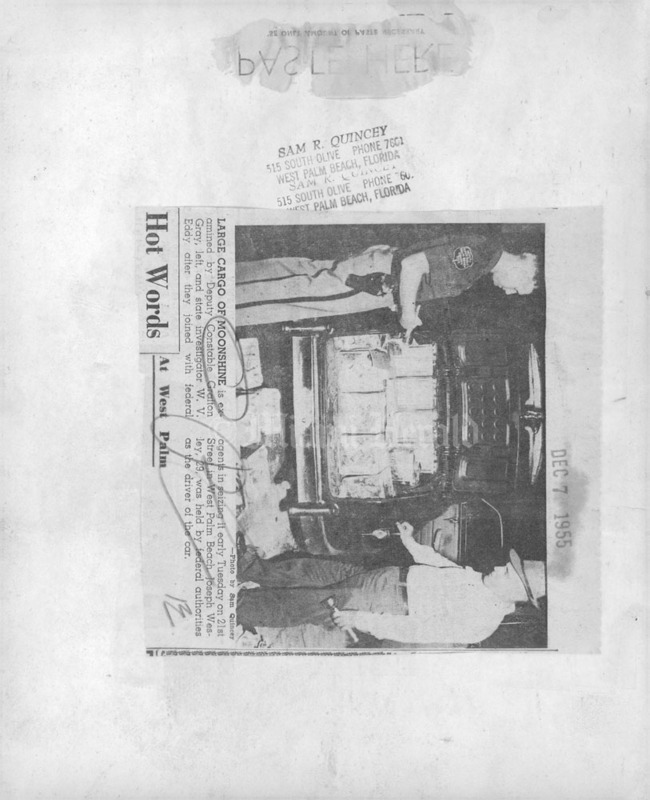 Agents are William Behen, Tom Wood and Charlie Brown. 10/7/1965, Tom McCarthy/Miami Herald Staff: Moonshine. Lying in Shambles is still wrecked by Moonshine. 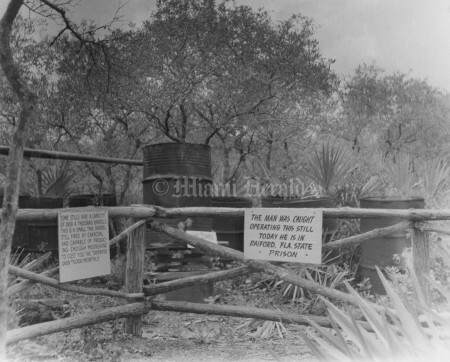 10/1/1974, Miami herald Staff: Moonshine Still South Dade. 10/1/1974, Miami Herald Staff: Moonshine South Dade. 3/25/1959, Bob East/Miami Herald Staff: Moonshine - Still operator. 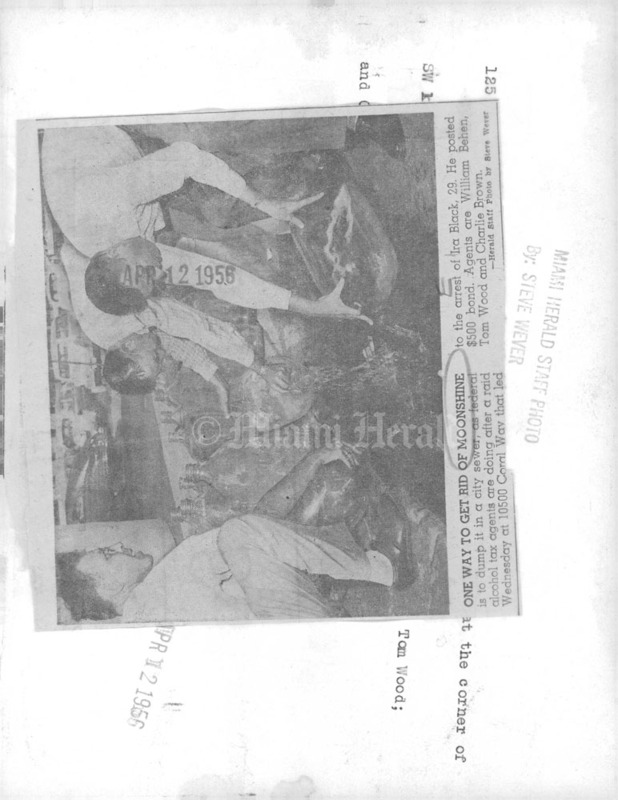 3/25/1959, Bob East/Miami Herald Staff: House at left held 5 gals home brew - at right was still. 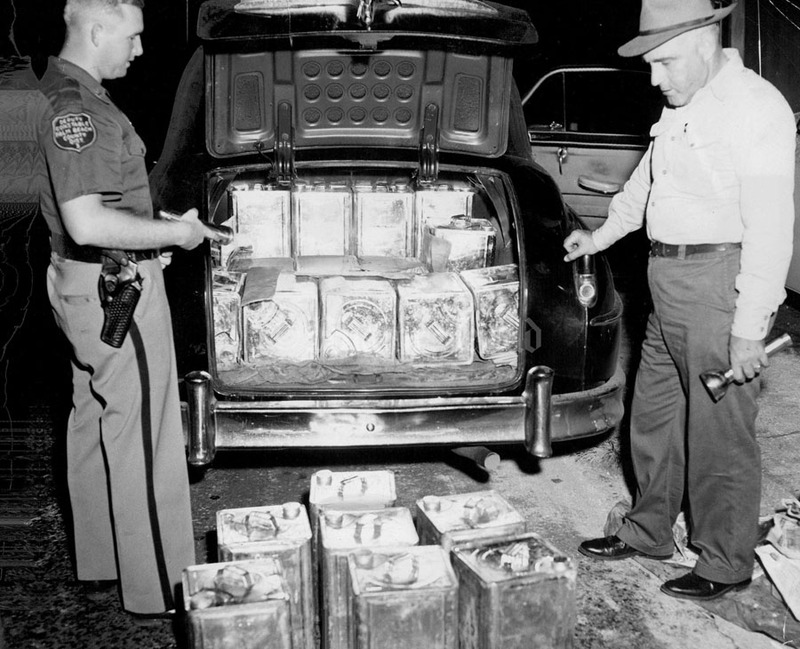 12/7/1955, Sam R. Quincey/Miami Herald Staff: Large Cargo of Moon shine is examined by Deputy Constable Grafton Gray, left, and state investigator W.V Eddy after they joined with federal agents in seizing it early Tuesday on 21st Street in west Palm Beach. Joseph Wesley,29,was held by federal authorities as the driver of the car. 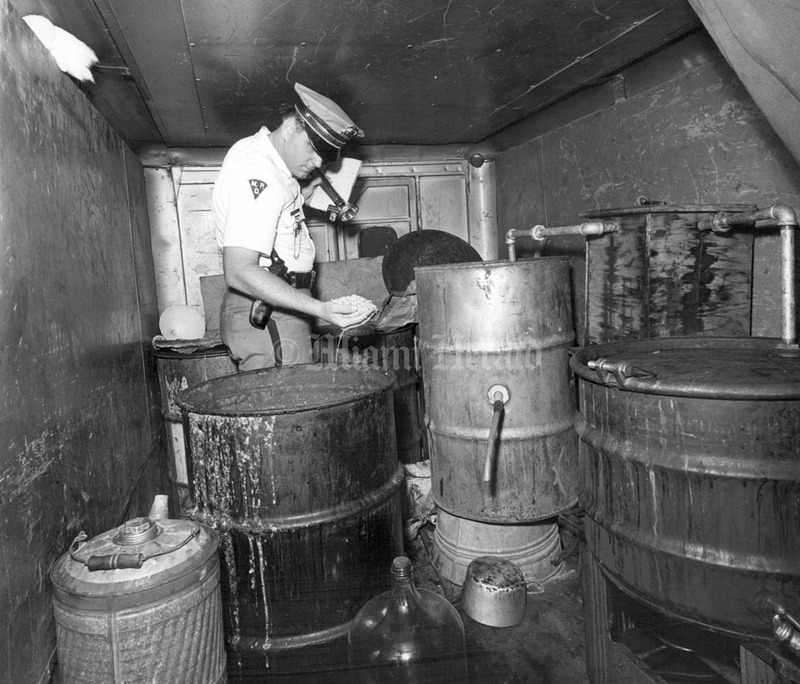 Undated: Sheriff's Deputies Clarence Sanders and Red Martin (L to R) inspect 720 gallons of mash at a still raided late Saturday night near Baca Raton. 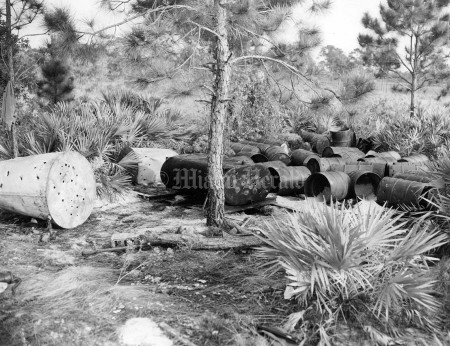 Six barrels were chapped up by the deputies. 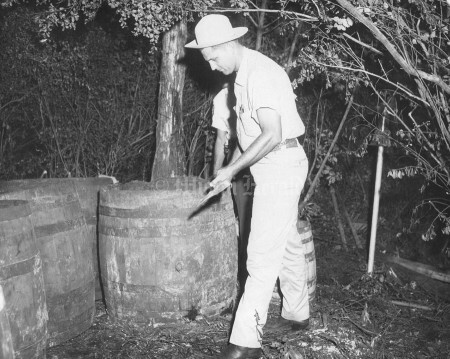 Undated: Chief Deputy john Kirk Jr. takes aim for a swing at one of six barrels of moon shine mash discovered late last Saturday near Boca Raton. 6/9/1962, John Walther/Miami Herald Staff: Shelton Kemp, chief enforcement officer for the State Beverage Department in South Florida, predicted Sunday that county-wide raids had crippled but did not end the moonshine business. 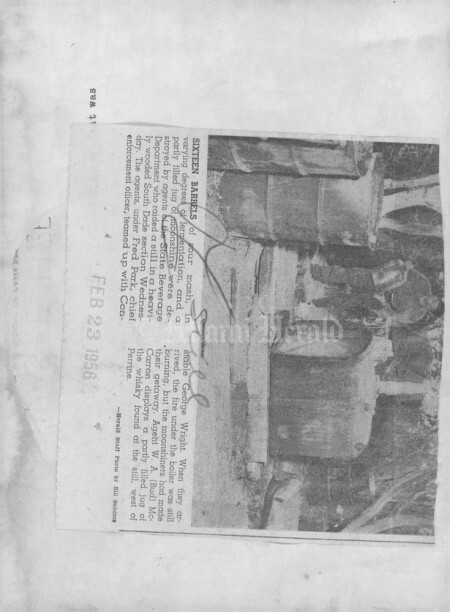 2/12/1960, Bill Kuenzel/Miami Herald Staff: Florida State Beverage men dump 200 gals of moonshine.